An absolute MUST HAVE for the Fair Warning fan and those as yet unfamiliar could do a lot worse than check out a band that excels in the live arena. Following two solid, if unspectacular albums in ‘Brother’s Keeper’ and ‘Aura’, and a lacklustre Firefest performance in 2006, one could be forgiven for thinking that Fair Warning were simply going through the motions. Finding themselves back on more familiar home turf in the land of the rising sun in 2010, we are treated to a completely different version of Hanover’s finest. Japan has always been the stronghold of Fair Warning where their popularity has not only survived, but grown year on year. Tommy Heart jokingly once said it’s like being The Beatles for a few days , such is the intensity that surrounds the band following their every move off stage and the open adoration on stage. 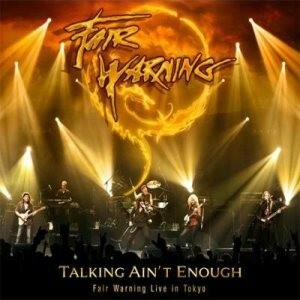 ‘Talking Ain’t Enough’ charts the bands return to live action in Japan in 2010, documenting one show from Tokyo and also their Loud Park Festival appearance in front of masses of devotees. For most this is the first opportunity to hear tracks from both the aforementioned albums live for the first time. Tracks such as ‘Generation Jedi’, ‘Here Comes The Heartache’, ‘Still I Believe’, ‘The Last Goodbye’ and ‘Falling’ certainly work well in the live scenario, and showcase the immense talent contained within the band. Messrs. Heart, Ritgen, Behrens and Engelke are more than ably assisted by longstanding keyboardist Torstein Luderwald and second guitarist Niklas Turmann, and live on the big stage FW are certainly a force to be reckoned with. With a third disc containing FW’s performance at Loud Park 2009 as an added bonus, there are a number of repeated tracks with chestnuts such as ‘Out On The Run’, ‘Get A Little Closer’, ‘Burning Heart’, ‘When Love Fails’, ‘Save Me’ and ‘Angels Of Heaven’ all making repeat appearances, but with this type of quality material on offer for a second time complaints by those inclined to moan about it are firmly and utterly disregarded. Sonically the album sparkles and with Tommy Heart in particularly fine form, cajoling a rowdy response from the normally reserved Japanese crowd whilst Engelke rings notes out of his sky guitar that inventor Uli Jon Roth surely must be jealous of. There is also a little taster of the dvd companion package accompanying this release, which by the looks of it will have Fair Warning fans shelling out on the double. The review copy is the Japanese release on Avalon and was extremely pricey, and with the dvd also on order both releases will total just over €100 .OUCH!!! With a November 19th European release date now confirmed for the live album only , this will afford fans the opportunity to pick up ‘Talking Ain’t Enough’ at a far more affordable price and still avail of what is no doubt a very, very serious value for money release, however, if like me you cannot wait to get your mitts on both the cd and dvd, the cd is currently available in Japan and the dvd has a release date of October 6th with no European release date yet confirmed for the dvd package. Normally I would say a fine return to form, but Fair Warning’s problems have never been about live performance, so shall I say an absolute MUST HAVE for the Fair Warning fan and those as yet unfamiliar could do a lot worse than check out a band that excels in the live arena.